Have you just “won” NaNoWriMo? Or are you sitting on the first draft of a manuscript but not sure what to do next? As part of the workshop, one-on-one critiquing sessions with editors will be offered for manuscripts and query letters. Participation in the critiquing programme will incur an additional charge. More information can be found here. A list of the editors participating can be found here. Critiquing programme is now closed. The full programme for the workshop can be found here. Registration is now closed. 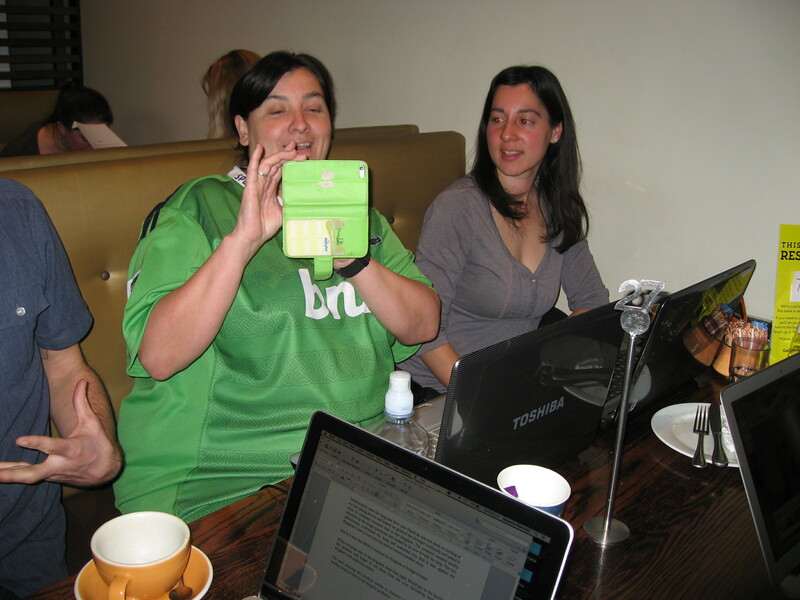 This entry was posted in Events, Workshops and tagged Christchurch, editing, workshop, writing. It comes with a rumbling, a deep and guttural roar. My feet awake first, propelling me out of bed and across the floor almost before my brain has registered: “Earthquake!” Into the doorway, ground rolling beneath my feet. Fingers clutch the frame, crouching, eyes scrunched closed. As if that makes it any easier. As if the night is not dark enough. The house groans and moans, bucking like a beast untamed. No room for thoughts in my head – just a desperate plea. Around me, crashes and bangs. Thumps from below. It feels like an eternity. Then, silence. Deep, profound; broken only by the distant sounds of car alarms. I grab my husband, crouched in the adjacent doorway, and hold him tight. Insanely, a sense of relief pervades me. This was the Big One, they’ve been threatening it for years, the Alpine Fault, due to fracture at any time. And we have survived. No power, no Facebook. The phone lines are all jammed, but I fumble off a text message to my mother, on a phone that’s nearly dead. I cannot stop shivering. Can’t find the flashlight, but husband grabs the fully charged laptop and we use it to light our way downstairs. A mess. The thumps had been our tall book cases, and the floor is littered with books, lying like broken birds. Upstairs, my television, a 17-inch brick, had crashed to the floor within arms reach of my refuge. And I hadn’t even registered it. The front door is stuck, so we wrench it open. I walk to the road. All seems oddly still and calm. No broken building. With no power, I seek shelter in my car, fumbling to find a radio station and a news report. Magnitude 7.1. No reported casualties. Sirens break the silence with their screams. We crawl over the bookcases and into the kitchen, fumbling to plug in the old-style phone. Dial tone, but it won’t ring. The lines must be jammed. Adrenalin dying, exhaustion takes hold. Aftershocks rattle on continuously, as we huddle on bean bags in the upstairs doorway, shaking with cold and nerves. Finally, I allow my husband to coax me out of the (perceived) safety of the doorway, and back into bed. I bring the bean bag with me. As if that will help. We hear from our family. They’re alive and okay. Just scared. We’re all scared. Dawn comes, and with it a still surreality. Power is restored, but as aftershocks continue to rattle the house, my nerves cannot take being confined within walls. The frost has melted away, into a sunny spring day, and I join the multitudes as they roam the streets, cameras in hand, looks of stunned disbelief on their faces. Scarce a chimney left standing. Brick walls are toppled. Local shops reduced to rubble. This entry was posted in Events and tagged Angela Oliver, prose. NightWriters. Nightowls. We’ve gone through a few name changes, but still ultimately the same thing. So what is Tuesday Nightowls you ask? It is essentially a regular social gathering of Guild members as well as any other budding writers whom wish to engage with other writers in a friendly, casual atmosphere. What do you do in these Tuesday Nightowl gatherings? You can write, you can talk or just sit and people watch over a cup of coffee. 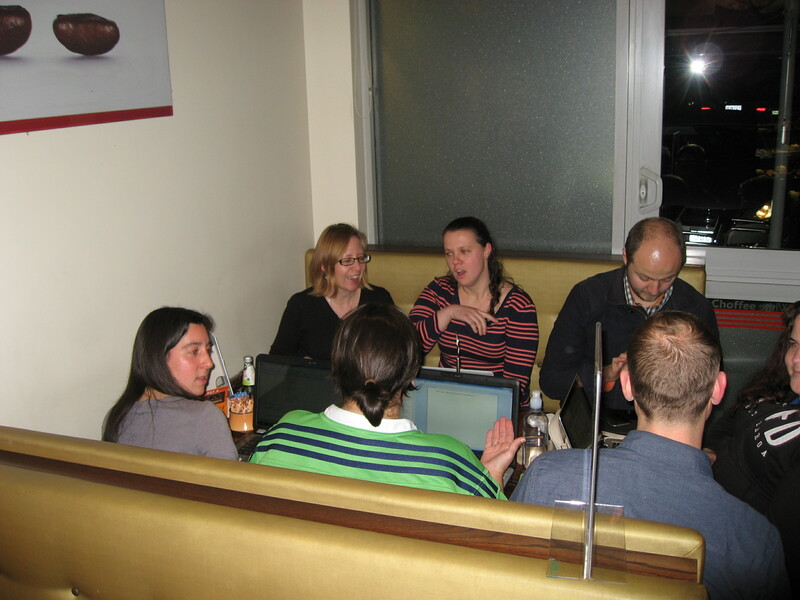 Having space to write is important for any writer and it is ensured that there is space available regularly for those that need it, and don’t mind the active café atmosphere. Conversations, while they will draw you away from writing time, can be quite helpful in the creative process. Brainstorming over ideas, problem solving over a writers block, or lamenting the woes of publishing, a helpful ear is but a booth away. With a growing number of Nightowls, there is a wide range in resource to help. We do have one rule though; if they’re in the writing zone, don’t bug them too much. Good thing we set aside two booths so one can happily write, while the other can happily converse. 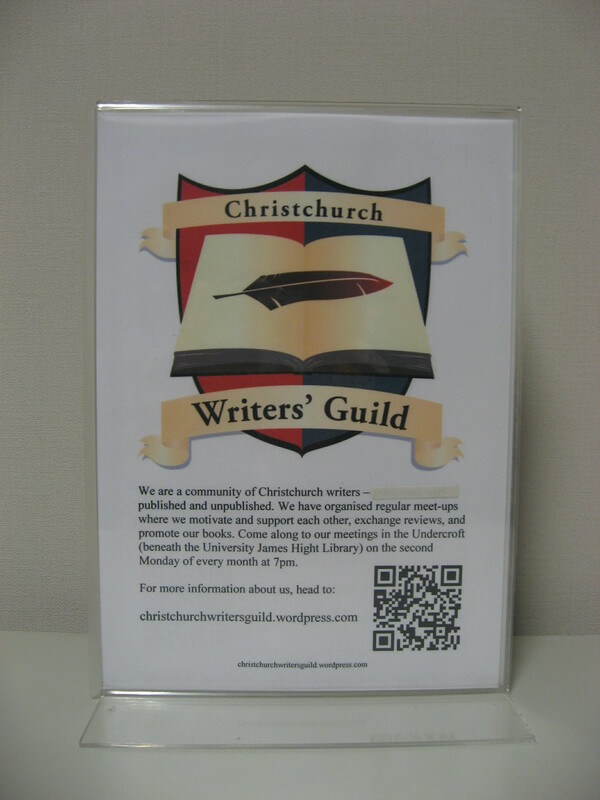 The Christchurch Writers’ Guild, though specifically Chris Yee is the one that manages the Nightowls. You can enquire for contact details, however the best way to get in touch with him is through the Guild Facebook group. Where and when do they happen? 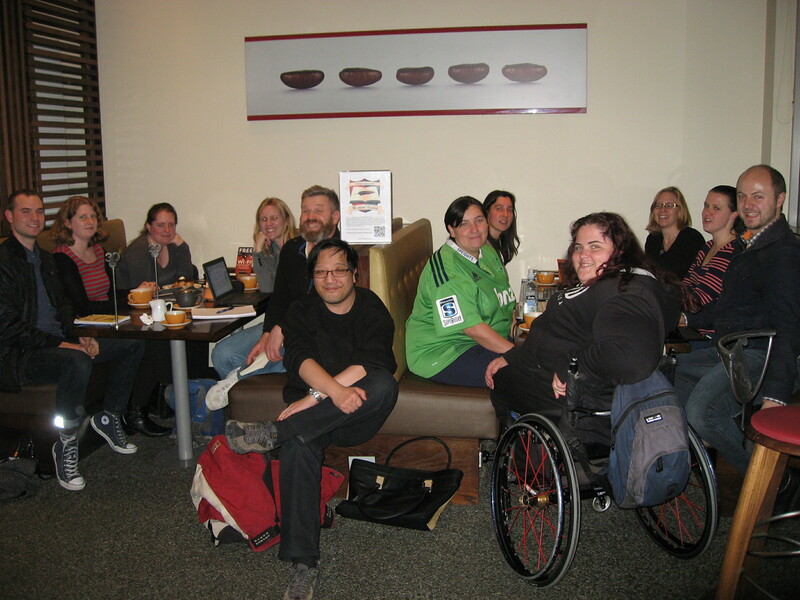 The Tuesday Nightowls meet from 7pm until late at Bush Inn Coffee Culture, so writers can come in and leave at any time they please. There may be times when we shift venue, and this is usually communicated at least a week beforehand. To find the booths we’ve booked, look for the sign with the Guild logo on it. Or the group with many a laptop open. How did this idea come about and how long has it been going on? This came about as an idea between myself (Chris Yee) and a fellow guild member, Shelley Chappell after finding that the Monthly Guild meetings left quite a gap in between socialising and up to date news on the literary world. Evenings were the best choice for those that work during the days, so deciding which day would work best for everyone proved to be a bit of a puzzle. 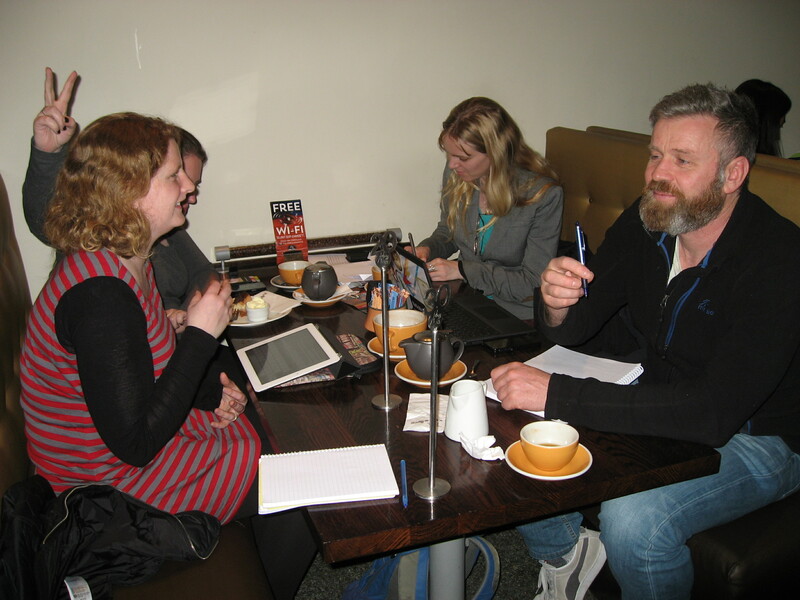 Through a stroke of serendipity, a mysterious writer appeared in the Canterbury Writers Meet-Up advertising for a regular meeting to occur on Tuesday evenings. After a bit of digging around to the location of Addington Coffee Co-Op, it seemed that this was outside of the trading hours (this was before I knew you could book it in for evening use), and so the first Write-In occurred on February 18th, 2014, in Riccarton Starbucks with a total of four showing up. With testing of various venues over the following couple of months until we settled on our regular nest, it has been continuing on strong since. One night we had 12 people trying to vie for seating! These days we average between six to eight, but there are always new people showing up. Due to its popularity, East Side Writers had been formed to accommodate for those that could not make it to Riccarton in the evenings, as well as allow those with time in the mornings to have that much needed social engagement and writing space. 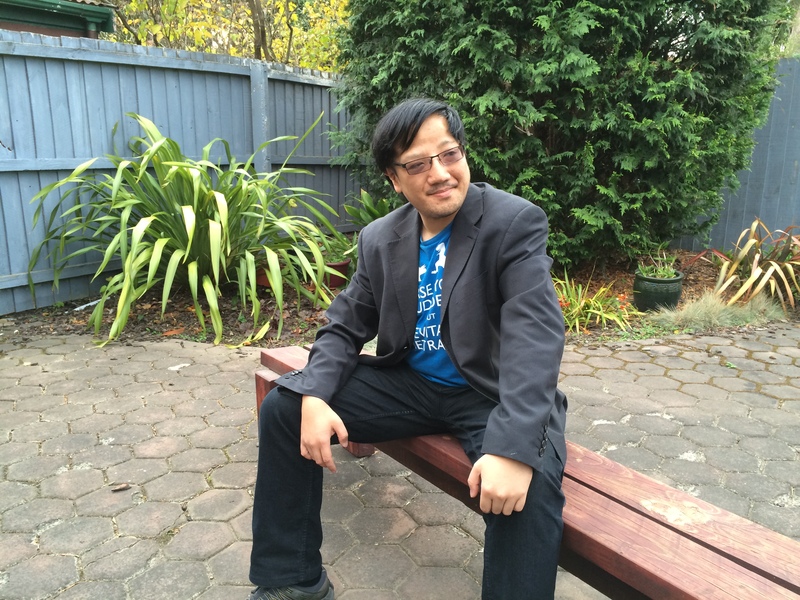 Chris Yee is, among other things, a game designer, writer and lego expert. He is also, the Guild Treasurer and great at organising things. This entry was posted in Events and tagged Chris Yee, event, Guild members. 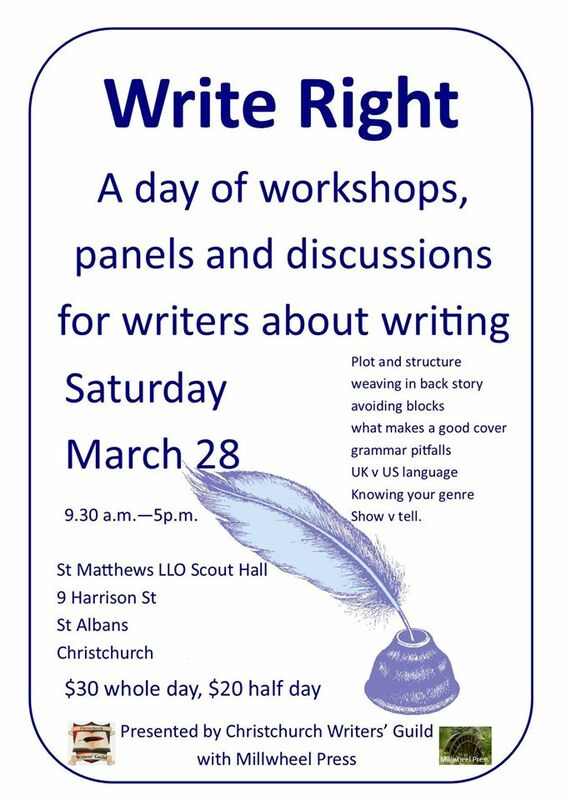 Join us on saturday, March 28th, for a day of writing workshops, panels and discussion with a number of like-minded individuals. 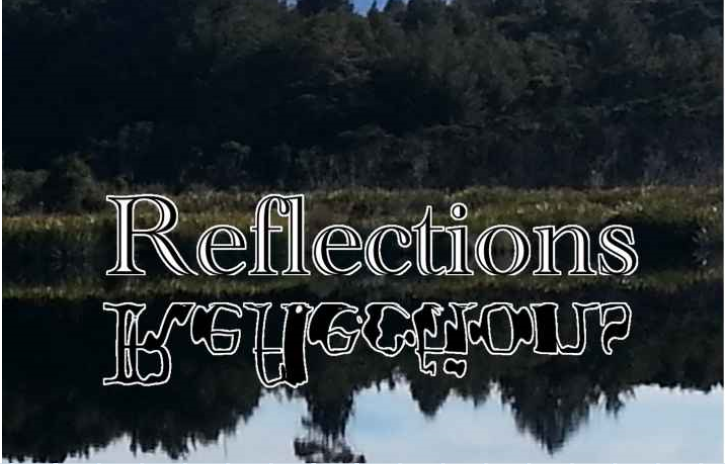 Presented by the Christchurch Writers Guild with Millwheel Press. I found myself signing up to Camp NaNoWriMo yesterday. “What is Camp NaNoWriMo?” I hear you ask. I asked the same thing! But really simply, it’s the same as NaNo, but not in November. There’s a few differences. It uses a different website (though you can log in with your NaNo details). It’s run twice a year, rather than just once. And you get allocated to a “cabin” which has 4 other random campers in which you can chat to and support during the month. That makes it an awesome way to meet new writers and build new friendships (which is totally in line with April’s themed blog posts: Writing and Relationships). It also seems very easy to change your words goal, so if you just want an awesome environment to get some amount of words down, set yourself a goal and come join in. There will be weekly meet-ups at The Make Cafe on Sundays from 2-4pm. I’ll make sure the ladies will know which table to point you to if you decide to turn up. I’ve made a Facebook Group for us. If you’re in Chch or the Guild and participating jump into the group for the month and join us. We (Tammie and I) will probably post random challenges and dares throughout the month just to keep things fun and interesting. Join us. 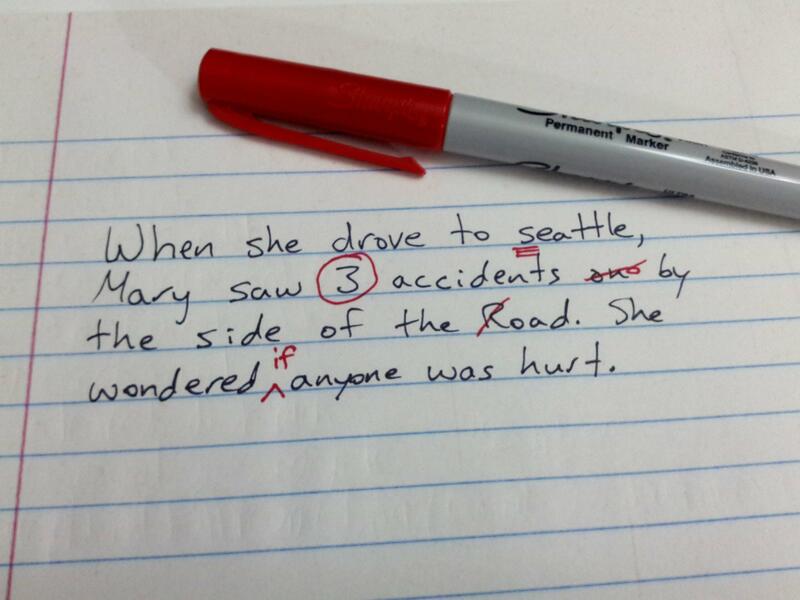 Write words. Have fun! This entry was posted in Events, NanoWriMo and tagged April, CampNaNoWriMo, writing.